"You are my star, you light my way, you brighten all my nights and make my day..."
THE LITTLE SISTERS (1983-1995) define an era that I deem the Golden Age of Miss Universe. Admittedly, I confess that I accidentally stumbled upon the Miss Universe broadcast on CBS only the year previous to the Little Sisters' debut at the St. Louis, Missouri pageant. Ever since that hot and humid night in July 1983, the evening gown segment of the annual telecast would rank as my absolutely most favorite part of the entire production. The Parade of Nations and the culminating crowning moment came in a somewhat distant second and third place, respectively. Some neophyte may ask what the big deal was when a bunch of kids gave flowers to the Top Ten as they modeled evening wear. To me, the Little Sisters ritual transformed the Miss Universe telecast into a magical and seemingly royal event. The evening gown competition back then was far from the catwalk show of today in which bare legs and hanging cleavage have replaced the signature sashes bearing the names of sovereign nations. The Little Sisters endowed the pageant with more than a healthy dose of elegance, class, and downright puppy-dog-and-lollipop warmth and fuzziness. It was all rolled into the ten minutes for which I waited a whole calendar year. So let me go on about it: year by year. 1983 There was nothing exotic about the venue, St. Louis, Missouri. No catch-phrases to learn in a foreign language, no colorful folkloric dances. Bob Barker announced that every beauty delegate was assigned a little sister: a local youngster (age 3-9) who would wear the banner of her "big sister" and accompany, look up to, and root for every contestant. The eighty-or-so little girls sported identical knee-length frilly white party dresses and white Mary Janes with white stockings. All wore white ribbons in their hair and belted out the very first Little Sisters musical medley known as "You Are My Universe." This early melody (pre-dating "You Are My Star") simply sounded too corny for the grand occasion, but for the first four years, the sisters would smoothly switch to "You Are So Beautiful [To Me]" during the second half of the evening gown presentation. The Little Sisters presented a small bridesmaid-style bouquet (streamers and all) of white flowers to each of the twelve (sic)semi-finalists. 1984 In its second year, the Little Sisters' appearance at Miss Universe replicated the "Easter Sunday" uniforms from the year before. The venue was Miami, Florida, but the background scenery was so plain and dull, the pageant could have been held in Anywhere USA. The 1984 sisters represented all races: Black, White, Asian, etc. So did the 1984 semi-finalists. In sharp contrast to 1983 in which eight of the twelve semi-finalists were of European origin and in which only two token semi-finalists represented all of Asia [Singapore] and Latin America [Venezuela], the 1984 Top Ten turned out to be a complex ethnographic representation of the Universe. 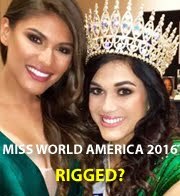 The host representative, Miss USA, was half-Chinese and half-Irish. It was no wonder her national costume was appropriately symbolic of Native American culture. Miss Thailand grew up in LA and spoke 'perfect' English. No one in the audience batted an eyelash when Miss Holland (a tall, svelte black model) and Miss South Africa (a green-eyed blonde) were both named as part of the Top Ten. As for the evening gowns featured, Miss Philippines delighted the audience with a multi-colored sari wrap-around with a flowing scarf. Miss Sweden wore an excruciatingly modest ice-blue lacy dress with matching cape. She looked like she had just finished playing the role of the Blue Fairy in Disney's Pinocchio. Miss Holland modeled an elegant black strapless with black elbow-length gloves. Miss South Africa showcased a 1950's-style ballgown in a striking crimson color and Miss Venezuela concluded the presentation with a princess-like royal blue gown with 'poofy' shoulders trailed by a fluttering train. 1985 Third year of the Little Sisters. Second year of the Little Sisters......in Miami. In my opinion, not much stood out - at least aesthetically - this year. Historically speaking, though, 1985 was a progressive time for the Miss Universe pageant. The crown was won by the second Puerto Rican in fifteen years, the USA was represented by a Mexican-born woman from Texas, and perhaps for the very first time ever, a black African [Miss Zaire] not only became a finalist, but finished as 2nd runner-up. Only the year before, a white Miss South Africa came in as 1st runner-up and only seven years previously, a white South African was crowned Miss Universe by succeeding a black lady from Trinidad and Tobago. Miss Universe fans of the very vintage kind (such as myself) will fondly remember how the whole Universe was rocked when, in her turn in 1977, Janelle Commissiong became the first black woman to sit on the Miss Universe throne. It would be until the near-end of the century, in 1999, that the Miss Universe crown would come to rest on the head of an African-origin queen representing a free and independent African nation [Botswana]. By 1985, it still seemed like Europeans and Americans (from the whole Western Hemisphere) would dominate the contest indefinitely. I wonder if some of the Little Sisters (who happened to be Black or Asian) would inwardly ask themselves if they would ever get to see one of the Big Sisters who shared their darker skin and features get to wear the big crown and take the victory walk waving to the crowd amidst the thunderous applause. In 1984, the Miami Little Sisters were witnesses to a blonde Miss Universe [New Zealand] crowning another blonde Miss Universe [Sweden]. In 1985, those same Miami sisters saw a green-eyed brunette from the Spanish-speaking Caribbean isle of Puerto Rico ascend the throne without shedding any tears or quaking her chin. 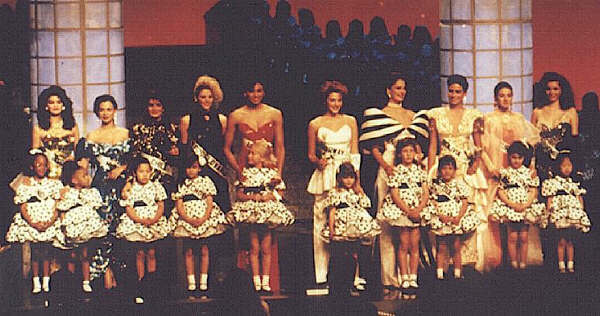 Thus began the Latin American streak of Miss Universo. 1986 The Republic of Panama was the host country and this the year the catch-phrase to learn in Spanish was "Mi Nombre es Panam?" [My name is Panama]. I was very impressed with the background scenes and the dance numbers - performed by the Ballet Folklórico de Panamá - which peppered the whole production. The scene for the evening gown presentation was quite elaborate. The audience takes a peek into a lively street scene at night in Panama City. We see the French-influenced architecture of the turn of the last century coupled with a troupe of traditional folk dancers. The lady dancers overwhelmed the stage with their "polleras" - the full-skirted white dress of ladies from Central America and the Caribbean. As the ladies retreated with their ample skirts, we discover a kiosk in the center of the Plaza Mayor. At the foot of the kiosk, ten little girls holding very simple floral arrangements eagerly awaited the appearance of their Big Sisters. The Top Ten, each in turn, stepped down from the kiosk and greeted the Little Sisters assigned to them. I noticed with not-so-minor disappointment that the other sixty-or-so Little Sisters (those assigned to delegates who did not go into the semi-finals) were relegated to the far right corner of the Panamanian panorama. From this rather isolated vantage point, the 1986 sisters delivered the final rendition of "You Are My Universe." By the end of the night, the Universe belonged to Barbara Palacios Teyde of Venezuela. 1987 Surprising Singapore was the venue. The scene for the evening gown competition was an Oriental moon gate surrounded by the Singaporean Little Sisters. Bob Barker (in his last year as emcee) introduced this year's sisters by proclaiming one of them may grow up to become Miss Universe 2000. A star WAS born that night: the Little Sisters anthem, "You Are My Star", which became such a long-standing tradition until 1994. Years later, almost anyone who has heard this strikingly poignant melody will instantly recognize it as the song lauding the 'celestial' qualities of Miss Universe contestants. The gowns this year were so 1980's funky/psychedelic. Wearing a glove-fitting "Chinese red" tunic, Miss Italy was the first semi-finalist to pass through the moon gate. The exotic lady who followed in a raven-black strapless with black opera gloves was Miss Philippines. Miss Venezuela and Miss Sweden imitated each other by modeling high-necked pink gowns with overstated pink ruffles at the bottom. Miss Peru 'took the cake' with a strapless which seemed to be molded out of a teal-colored aluminum foil!! Miss USA's selection was a traditional princess gown in violet. The host delegate, Miss Singapore, also wore a princess gown in a scarlet color, and the bust was enveloped by a trellis of black lacework. Miss Chile's white strapless was beautiful with a long, flowing train. The Universal crown, which would soon sit on her head, could have been effortlessly substituted by a bridal veil. To end on a completely bridal note, the flowers at the 1987 contest were bouquets of purple, pink, and fuchsia orchids. 1988 The charm and splendor of Cathay (ancient China) provided the setting for the pageant held in Taipei. The Taiwanese dance troupe and the fairy tale scenery divulged sheer delight to the senses. This year's evening gown presentation is so visually stunning that I rank it as my favorite in the history of pageantry. Ten beautiful maidens have been invited to a ceremony to be held in the gardens of the Emperor's palace. The Taiwanese dancers initiate the ceremony by silently marching in with Chinese lanterns. Once the "guards of honor" have taken their posts, the sixty-six Little Sisters of Taiwan (who are attired in traditional Chinese brocade) serenade each of the ten semi-finalists as they glide across the drum bridge straddling an imaginary bubbling brook. The Top Ten are presented with the national flower of the Republic of China [Taiwan] - the plum blossom. The gowns selected by many of the semi-finalists fit in perfectly with the fairy-tale theme. Miss Hong Kong wore a knee-length "prom frock" in carnation pink with pink roses and black velvet (?) leaves and stems as part of her bodice. Miss USA presented herself in a black strapless with embroidery work in silver depicting delicate branches and leaves. Miss Japan resembled the Empress herself in an imperial red ballgown with a matching train fastened by red rosettes. Miss Korea, who finished 1st runner-up, was truly the Cinderella of the event, looking the part in a mint green ballgown with a delicately flowing train secured by an imposing bow in the back. But the queen of the ball (and the Universe) was a supremely composed Miss Thailand. 1989 The Caribbean region of Mexico's Yucatán peninsula hosted the seventy-six delegates to the 1989 contest. Cancun (in the Mexican state of Quintana Roo) was the venue. The Little Sisters of Mexico sat on the steps of a Mayan pyramid to salute the Top Ten with the "You Are My Star" anthem. There is a fade-out to the tender moment the delegates first meet their Little Sisters prior to the telecast. At the foot of the pyramid and after receiving a pink rose, each Miss executes an unflattering mini-catwalk strut at center stage. Up until that point in MU history, the contestants were required to gracefully stroll around in a small circle instead. This microscopic deviation from protocol was a telling sign of things to come in the late 1990's (when the pageant gets "Trumped"). 1989 THE CARIBBEAN REGION of Mexico's Yucatán peninsula hosted the seventy-six delegates to the 1989 contest. Cancun (in the Mexican state of Quintana Roo) was the venue. The Little Sisters of Mexico sat on the steps of a Mayan pyramid to salute the Top Ten with the You Are My Star anthem. There is a fade-out to the tender moment the delegates first meet their Little Sisters prior to the telecast. At the foot of the pyramid and after receiving a pink rose, each Miss executes an unflattering mini-catwalk strut at center stage. Up until that point in MU history, the contestants were required to gracefully stroll around in a small circle instead. This microscopic deviation from protocol was a telling sign of things to come in the late 1990's (when the pageant gets "Trumped"). 1990 THE LITTLE SISTERS' getup stole the show this year. Since the venue was Hollywood, what better costumes than the black-and-white polka-dotted Shirley Temple dresses (lollipops not included)? Elegance wed pure kitsch as each of the semi-finalists stepped down from a high pedestal and descended some very steep-looking stairs to receive a rose from a Little Sister. Haute couture made an alliance with ethnic pride. Miss India wore a gold/copper foil gown and she moved as seductively as a king cobra. Miss Turkey showcased her Middle Eastern heritage by modeling a coral harem-style satin pantsuit accessorized by an ivory-colored sheer gauze opera coat. I loved how you could still read Miss Turkey's banner through the transparent material. Miss USA Carole Gist (the first African/American to represent the USA**) had a sparkling red gown especially made to complement her dark skin. The eventual winner, Miss Norway, was the epitome of a cake-top bridesmaid in a white strapless with a white rosette and bow attached at the waist. **Halle Berry (aka Catwoman) represented the United States at the 1986 Miss World pageant in London. She acquired this distinction upon becoming the 1st runner-up at the 1986 Miss USA pageant. 1991 By 1991 (Las Vegas), it seems like the Little Sisters concept was never going to grow up and get out, just like Peter Pan. In reference to Peter Pan, the sisters wore ankle-length "Wendy" night shifts with black shoes and white stockings. What happened to the white Mary Janes? As much as we adore the Little Sisters, we the fans are noticing that they are beginning to become just a wee bit stale. I'm surprised they managed to cling on for a few more years. 1992 "THE KING AND I" meets Miss Universe in Bangkok, Thailand. Seventy-eight little Thai girls in native costume sit around a Buddhist temple from which the ten semi-finalists emerge. The only three semi-finalists wearing red gowns became the Top Three: Misses Namibia, Colombia, and India. Miss Namibia and Miss Colombia "carried off" their gowns with the most queenly grace, but Miss India executed her runway walk with a hint of urgency. As the only 'Asian' semi-finalist however, we did appreciate how adeptly she greeted her Little Sister in the Thai custom of placing the palms together and bowing. 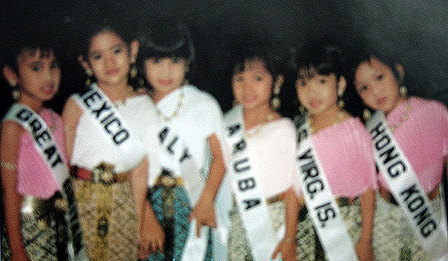 Modeling a Grecian-style aquamarine strapless with a silver bust, a raven-haired Miss Venezuela rendered a Thai 'greeting' which appeared somewhat affected and not as natural or authentic as Miss India's. Miss Australia wore a silver strapless accentuating the ends of her blonde hair cut in a severely straight line. Although her hairline was indeed stern, Miss Australia's expression was continually wide-eyed and innocent. The other semi-finalist from Oceania, Miss New Zealand, wore a gown that resembled something short of a magician's assistant costume. It was a downright 'd?class?' outfit bathed in an emerald green glitter. During the semi-final interviews, Miss New Zealand impressed me as cocky and self-assured without being arrogant. Her confidence alone, though, would not rescue her from her choice of evening gown. Miss Belgium, a blonde Betty Boop, followed Miss New Zealand's example with the exception that Miss Belgium opted to show off much more cleavage. A painfully shy creature in the form of Miss Sweden with classic Scandinavian looks timidly stepped down from the Buddhist temple in an austere, medieval-looking snow-white tunic. She instantly reminded me of the character of Desdemona in my favorite of all Shakespearean plays, "Othello." The most tender moment of this year's presentation occurred when the Little Sister accompanying Miss USA (a California blonde) waved to the audience as if she were Miss Universe and Miss USA was merely her "Big Sister"!!! 1993 PRETTY MUCH a repeat of the 1989 presentation in Cancun. Although I am not very proud of the boisterous manner in which the Mexico City audience booed and heckled the Top Ten (namely Miss USA) simply because Miss Mexico did not advance to the semi-finals. Miss Colombia: I liked her very long hair when it was down for the interview and swimsuit competitions. For the evening gown segment, she simply looked too "ghetto" for my taste. Too much make-up and the poor thing could barely walk in those six-inch heels and heavy, cumbersome train. Miss Colombia possessed striking, dark ethnic features and the black evening gown did not bring them out well, I think. Unbecoming plum-colored lipstick as well. Miss Australia: The single, curly bang was quite distracting. She wore it all night. Miss India: The copper-colored gown reminded me of the one worn by Miss India in 1990. Miss Spain: Her large protruding eyes and the slimming gown with the veil trimmed with feathers made Miss Spain look like a rare, tropical jungle bird. The sky-blue feathers around her neck did it. Miss Czech Republic: Her simple and stark black dress matched her dark hair and eyes to make this Miss resemble the kinder of Cinderella's step-sisters. 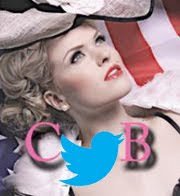 Miss Czechoslovakia was the blonde version in 1990. Miss Puerto Rico: The future Mrs. Marc Anthony made use of her train trailing her white strapless by making it 'float' during her ten-second spot in the limelight. Miss Puerto Rico 1995 was more effective in executing this "flourish." Miss USA: Others may vehemently disagree, but I loved the mango-yellow gown worn by Miss USA. I appreciate contestants wearing new and exciting colors at pageants plagued by the old stand-by colors of black and white. Miss Brazil: This contestant was reminiscent of the epoch when beauty delegates actually resembled debutantes. It takes a special lady to work the "butterfly wings" of this ballgown the way Miss Brazil did. Miss Finland: Another debutante look-alike. The overstated opera gloves and the large medallion gracing her throat were the accessories that made Miss Finland's gown. Miss Venezuela: Many critics at the time observed that Venezuela's Miss looked "titanic" with the huge bell-shaped skirt. All I noticed was that her Little Sister almost tripped trying to escape the ample mandarin-orange folds of the infamously large skirt. 1994 THIS WAS the Year of the Little Sister (in Manila, Philippines). A glorious sunset glowing through an elaborate gateway was the setting from which the Top Ten emerged to be serenaded with the eighth, and final, version of You Are My Star. 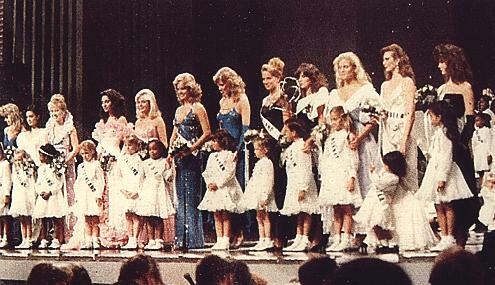 The Little Sisters assigned to the ten semi-finalists also acted as standard-bearers since, for the first time ever, the Top Ten appeared without banners during an evening gown competition. At the end of the telecast, the Manila Little Sisters occupied a prominent place of honor in the front part of the stage during the crowning of Miss Universe, Sushmita Sen of India. As the final credits roll, we see the Little Sisters disperse and float across the stage in their swan-white Filipina mestiza costumes. BY 1995, THE LITTLE SISTERS were unfortunately regarded as an afterthought. 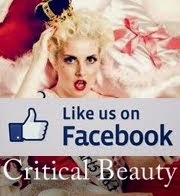 In that final year, the pageant was held for the first time in continental Africa. Namibia was the country of choice since MU 1992 hailed from this new nation on the Atlantic coast. The You Are My Star anthem had been dropped in favor of Deep Forest's Forest Hymn. The New Age musical selection was a refreshing (and appropriate) change for many. The scene was the vast Namibian desert under moonlight and the very last Little Sister to accompany a semi-finalist in an evening gown competition was the one assigned to Miss USA (and by the end of the night, Miss Universe) Chelsi Smith.